This theme is focussed on research concerning the terrestrial planets and other rocky bodies. We use a variety of complementary techniques to study these bodies using a range of observational, usually remotely sensed, datasets. The planet Mars dominates the theme, due to the large amount of data at present, but we are also studying Mercury, Venus, and exoplanets. A detailed comprehension of the internal structure of Mars is essential in order to understand Mars’ formation and evolution and is currently incomplete. The InSight mission of NASA's Discovery program aims to fill this knowledge-gap and will deploy a seismometer at the surface of Mars in november 2018. Members of LPG are involved in this mission and instrument. The seismometer will make it possible to detect and quantify the seismic activity of Mars for the first time, and to determine precisely the size of the Martian core, a key parameter of any model of internal structure. Important information on the temperature and composition of mineral phases present in the mantle of Mars will also be retrieved from these data. A comparison between the internal strutcures of Mars and Earth should also be possible with these data. Mars once had a global magnetic field originating from dynamic processes deep-down inside the planet as is the case today for the Earth and for Mercury. This ancient magnetic field has left traces of its presence, recorded in the magnetic minerals in rocks in the crust. New data from the MAVEN mission (launched in 2013) add to those of the MGS mission, as the two mission have very different orbital characteristics. Using these data, our aim is to improve the resolution of models of the martian crustal magnetic field, and to more precisely date the cessation of Mars’ dynamo. Presently estimates of this cessation range between 4.2 and 3.7 Ga. The exact timing of the cessation of the dynamo is important for constraining models of evolution of the interior of Mars, its internal dynamics, and volcanism. In addition this work will provide constraints on the processes involved in driving the martian dynamo, which will be compared with the terrestrial dynamo. From orbital spectral data (e.g., the OMEGA instrument on MarsExpress, or CRISM on MRO), the surface of Mars seems to be dominated by mafic minerals in basaltic rocks. Observations from the ground (e.g., ChemCam instrument on Curiosity) reveal rocks rich in feldspar, and abundant alkaline feldspars, or even quartz. Martian meteorites, including NWA7034, contain feldspars, particularly alkaline, lack olivine and have abundant iron oxides with evidence of hydrous and oxidising conditions ~ 4.4 Ga ago. We aim to analyse these three different sources of information to understand the nature of the crust and identify regions of ancient volcanism. 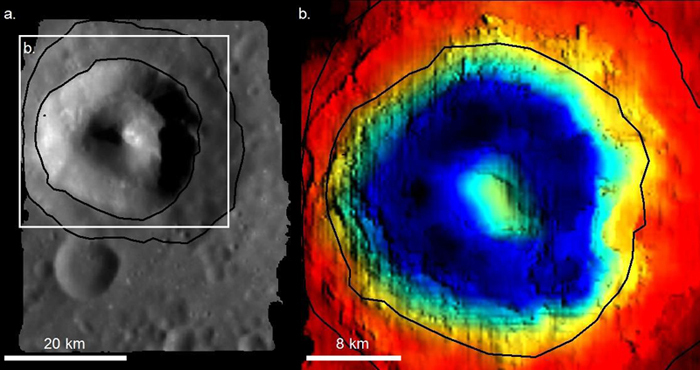 Impact craters will be a particular focus of this study, because they have good bedrock exposure - useful for identifying regions dominated by impact breccia or layered volcanic rocks. The objective is to better understand the origin of the ancient martian crust, which could be due to global magmatic events in the Noachian, or the crystallization of a (lunar-type) magma ocean. We will also be studying the degassing of volatile elements (including sulphur) and geochemical cycling of water induced by hydrothermalism. Under present-day martian conditions (cold and dry), the hydrous minerals, river valleys and alteration products that we find on the oldest martian terrains could not be produced. The duration, intensity and causes of this wildly different past surface environment remain poorly constrained, as do the processes involved (hydrothermal and supergene alteration), and how this primitive environment evolved. The possible presence life in the martian past remains an open question, but habitable lacustrine environments have been identified. To address these open issues, we will combine orbital observations, in situ observations and laboratory experiments. We aim to understand the context of formation of the oldest martian rocks/terrains, the links between the mineralogical assemblages and their genetic and chronological relationships. We will work on key regions (such as Valles Marineris, Mawrth Vallis, or Mount Sharp in Gale Crater). Future missions (ExoMars rover and Mars 2020) will provide additional datasets improving our understanding of the ancient martian environment. Laboratory studies (alteration processes on basalts under controlled atmospheric conditions) will make it possible to better constrain potential environments, and in particular to compare the minerals obtained with those observed on the surface of Mars. This work is part of the ANR MarsPrime project (2017-2021). The surface cyrosphere (polar caps) and the underground cryosphere (permafrost) are the main reservoirs of martian volatiles (H2O and CO2). We study these cryospheres through the analysis of geomorphological, spectroscopic and geophysical data, to define the current distribution of, dynamics of and interactions between these reservoirs. In particular, we are interested in recent gullies and seasonal dark tracks (Recurring Slope Lineae), which could be related to the seasonal activity of sublimating CO2, liquid water/brines. As part of this work, we will use the CaSSIS visible imager data on the ExoMars TGO probe launched in 2016, in which members of LPG are involved. Ongoing work involves primarily images and terrain models from MRO HiRISE (team members at LPG) and CTX. Another part of our work deals with the evolution of ice reservoirs over Mars’ history. The recognition of ancient glaciations constrains the history of surface and atmospheric volatiles. The interaction between the cryosphere and the atmosphere will be addressed via numerical models to quantify the presevation of palaeo-glaciers for several billion years and the redistribution of ice in current glaciers. The planet Mercury was recently observed by the American mission MESSENGER, (2011-2015). However, only the northern hemisphere was approached close enough to measure its internal magnetic field. This missing data (and others) will be acquired by the Euro-Japanese mission BepiColombo, which is due to be launched in 2018. Mercury has an internal magnetic field of dynamic origin, but it is very weak compared to that of the Earth. Internal and external contributions to and interactions of the magnetic field are difficult to disentangle, and this is the objective of the ANR MARMITE project (2014-2019). The surface of Mercury also hosts numerous volcanic structures. We study the links between the morphology of these volcanic structures, their possible composition in terms of fraction of volatiles, and internal processes. This work is supplemented by gravity field and topography data which provide an estimate of the solid fraction in the interior of Mercury (the rocky mantle plus a possible FeS alloy layer at the top of the core), to compare with existing measurements. The overall aim is to constrain the internal structure and evolution of Mercury. In the absence of seismological measurements, observation of the gravitational field, topography and rotation parameters of planetary bodies are the only constraints available to define the structure and dynamics of planetary and exo-planetary interiors. The restrained observational data on shape (radius) and gravity (mass) for these objects already leads to conflicting conclusions regarding the internal structure and make simple numerical modelling efforts necessary. Tidal effects must be taken into account in these models given the orbital context of such bodies. This work is based on numerical simulation and combines constraints provided by observations when they exist (see for example the satellites of Saturn), impact of the dynamics of the solid layers on the gravity field and dynamic topography. We aim to inventory the various dynamical regimes as well as more complex rheological structures for the terrestrial lithosphere. This terrestrial work serves as a basis to study the thin mantle of Mercury, evidence of a possible migration of Tharsis to the Martian equator, or the preparation of future space missions (e.g. the ENVISION project to Venus). The Earth and Venus have had a very different evolution, probably starting at the beginning of their geological history. Processes that could explain these differences include: prolonged meteorite bombardment, increased tidal dissipation during this period which may have affected mantle dynamics, crust formation and atmosphere formation. These processes are not restrained to our Solar System, and are probably universal to all the (exo)planetary systems we are currently discovering. In order to explore this topic we use 3D numerical models developed at LPG and/or with our collaborators (OEDIPUS, ANTIGONE, ACCRETIS) in recent years. These models allow us to consider the feedbacks between the internal dynamics, atmosphere formation, the hydrosphere and orbital evolution for different initial orbital configurations and planets of different sizes and compositions.